That's right, folks. There is no Thursday Thrift Score this week, for a couple reasons. (a) Have you ever noticed how frustrating it can be when you go thrift shopping with a specific item in mind? Say, for instance, you're looking for something in a lovely cobalt blue that needs no alterations? Yeah, that's tricksy. (b) I've been suffering from a minor case of The Plague this week. Okay, so maybe it's not The Plague, but there were certainly times I wished I were dead. Anywho, I'm on the mend now, but you still won't be seeing any pictures of my face today. I don't want to frighten anyone's children. So what's your consolation prize? Why, it's a bonus refashion! Picture this: I'm all tuckered out from an evening of clothes swapping at the Fabulous Ladies Clothes Swap last month. I'm hanging with my theater friend back stage while her crew boxes up the leftovers for charity, when someone grabs this stringy bit of who-knows-what and aims for the trash bin. "Wait!" I exclaim. "Is that suede?" "Uh, maybe. I dunno. It's broken though." 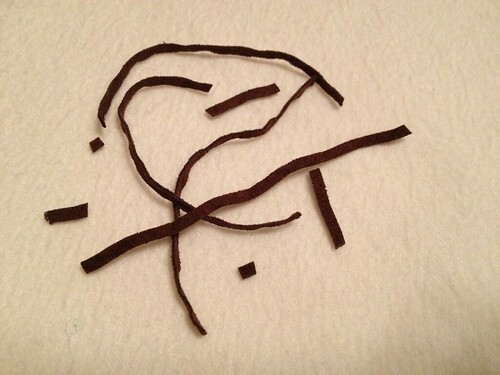 And with that, I saved this damaged braided leather belt-thingy from an unceremonious end. And I knew just what to do with it! 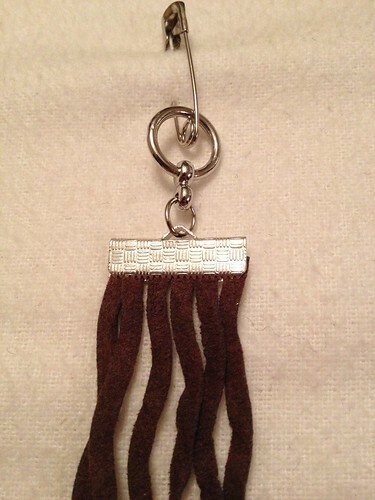 I grabbed some jewelry pliers, a couple jump rings, some ribbon crimps, a clasp, and a safety pin, and I got started. 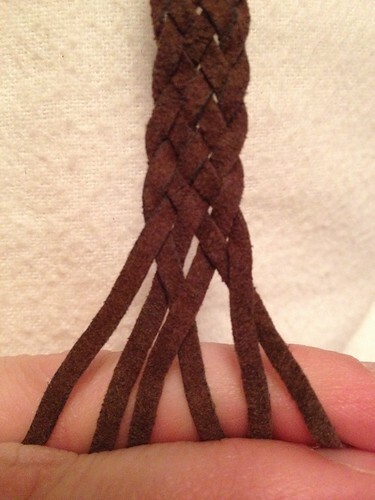 As you can see, one of the strands of the braid was broken and that end had begun to unravel. 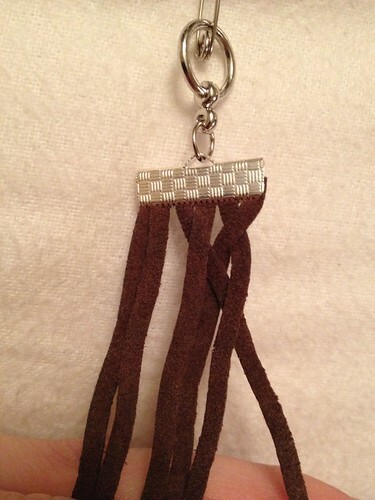 I snipped off the tassels, unraveled the whole braid, and cut each strand in half. I clamped one end of each of those six strands into one of my ribbon crimps and used a jump ring to attach one end of my toggle clasp. 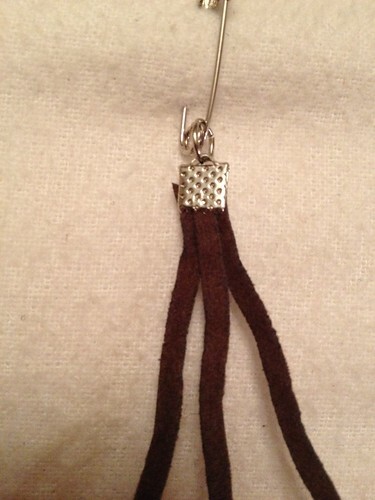 The safety pin holds my project in place while I work. I like to pin it to my jeans or something. For ease of explanation, let's name each strand from left to right, numbers 1-6. To make a six-strand flat braid, I first crossed strand 5 under strand 6. So the new order is 1, 2, 3, 4, 6, 5. Then strand 3 goes under 4, over 6, and under 5. New order: 1, 2, 4, 6, 5, 3. Next, strand 1 goes under 2, over 4, under 6, over 5, under 3. New order: 2, 4, 6, 5, 3, 1. Then just repeat that last step over and over again. 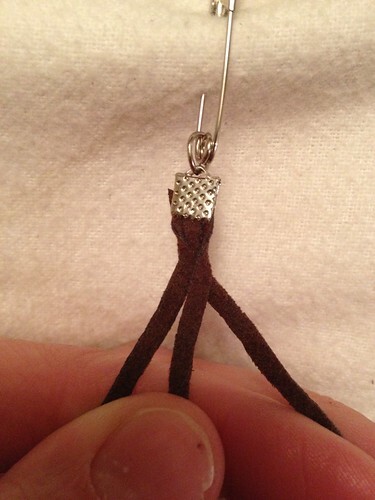 Take the left-most strand and weave it under, over, under, over, under toward the right. Tug on the strands a bit to tighten it up as you go. Once you've got a length of braid you're happy with, here's how you finish it off. The left-most strand goes under, over, under, and then stops. Then the new left-most strand goes under the second-to-the-left and stops. 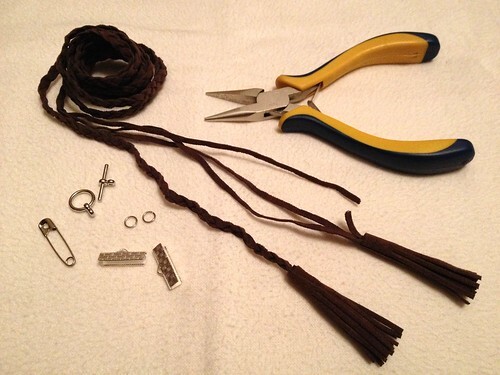 Next, carefully hold your braid in place, snip the ends with your scissors, and add another ribbon crimp. 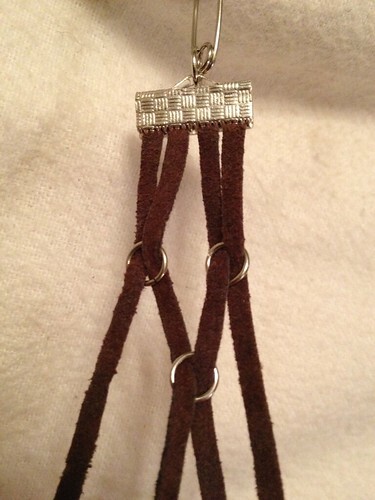 One more jump ring and the other half of the toggle clasp complete the bracelet. Or do they...? 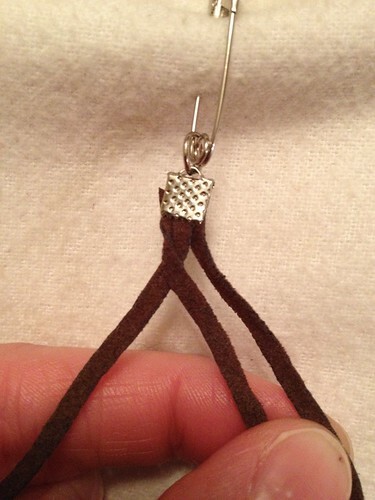 Once you realize you don't the ability to fasten a toggle clasp one-handed, replace it with a different clasp you can fasten. And now you're done! But considering my original belt was 60 inches long, that left me with a whole lotta leather still. 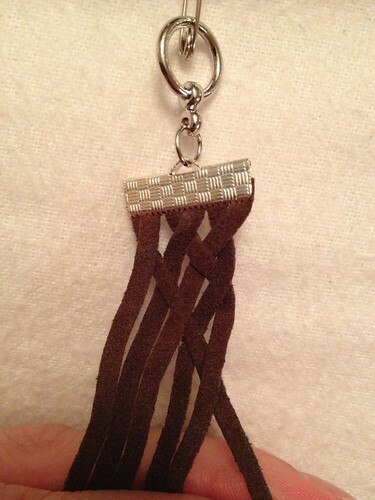 So I grabbed a small ribbon crimp and three strands of suede. 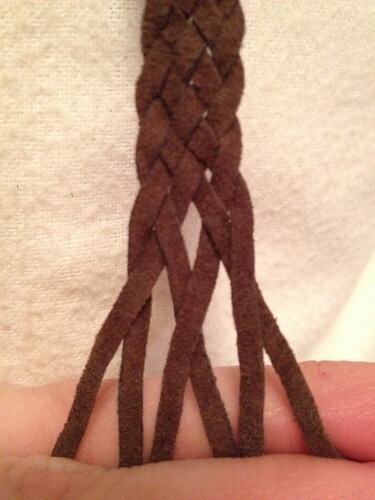 I wanted to make a rounded braid instead of a flat one, so I actually folded the left strand over the center one. Then I folded the right strand toward the center. And so on and so forth, like a normal braid but with folding. 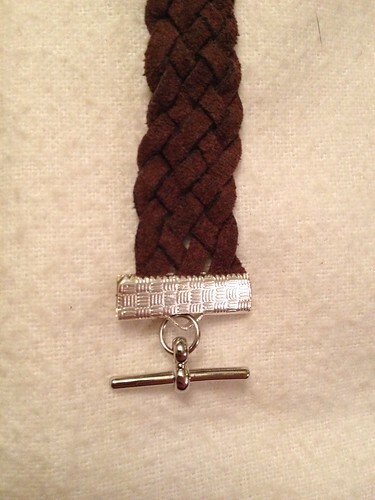 When I had a bracelet length, I cut it off and added another crimp and a clasp. Then I ventured away from braids. I used four strands and some jump rings to create another bracelet. Strand 1 goes up through a jump ring and strand 2 goes down through it. Then strand 3 goes up through a second ring and strand 4 goes down through it. A third jump ring is added to the middle, with strand 2 going up and strand 3 going down. 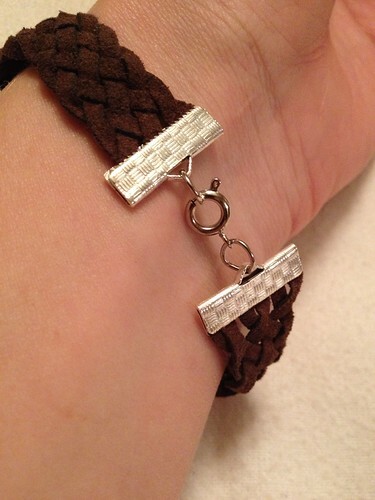 I alternated strand pairings until I had my bracelet complete, then crimped and clasped. Then things just went crazy. I found a tear-drop-shaped stone in my odds-n-ends box and looped a couple strands around it for another bracelet. I also found an old charm that says "Are you pondering what I'm pondering?" (Any Pinky & The Brain fans out there?). 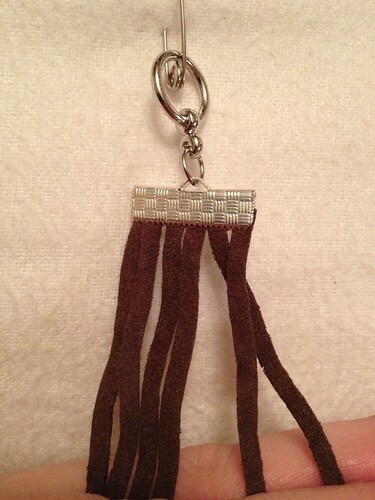 Another strand of suede turned that into yet another bracelet. 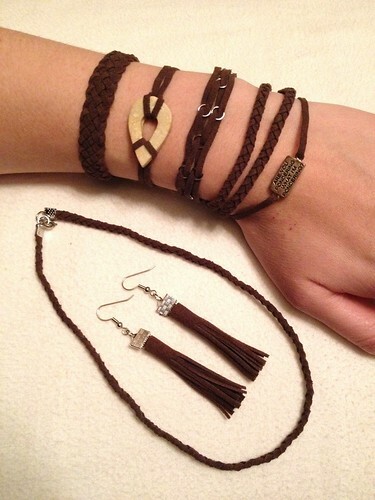 I made a second rounded braid bracelet and a necklace to match. 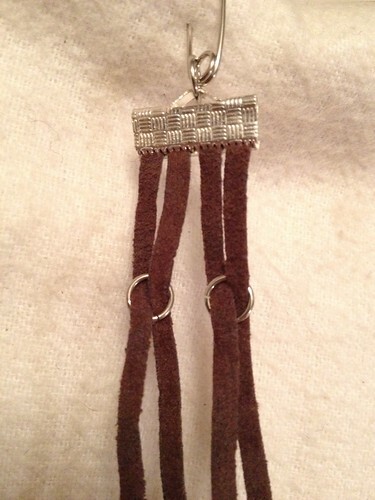 And finally, I crimped the tops of the tassels and attached some ear hooks. So all totaled, from one broken belt that was about to be summarily tossed, I produced six bracelets, a necklace, and a pair of earrings. In case you're wondering, here's what was left over. Wonderful tutorial, thanks for sharing. I hope you feel better. Oh yeah, there was definitely enough leather to go around. And now I'm thinking back to one of my husband's old busted braided belts that I swear I stuck in one of my craft boxes somewhere. But that was before we moved, so who knows where it is now! When I find it though, you can bet there'll be more leather accessories in my future! Carissa!!!! You are AMAZING ---- in sick mode and, STILL, so creative --- you just never stop. Merry Christmas!!! Well, after having been too sick to do anything but lie on the couch for several days, I was starting to get a little antsy! Gotta let the creative juices flow! Happy holidays to you too! You are multi-talented - nice pieces, and great job on using up almost every bit. Hope you're totally over The Plague by Christmas! Thanks, Jenny! I certainly hope so too!